Adams Oshiomole’s wife and 334 other foreigners get Nigerian citizenship – Royal Times of Nigeria. A total of 335 foreign nationals yesterday were granted citizenship by the Nigerian Government after statutory clearance and due diligence by the relevant security agencies. 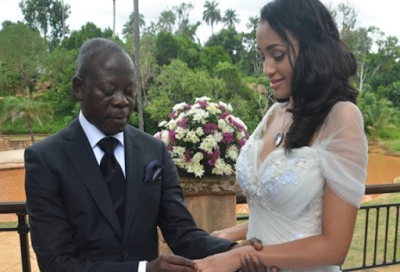 Mrs Iara Oshiomhole, wife of former Governor of Edo, Adams Oshiomole‎, who hails from Cape Verde was one of the recipients. Minister of interior Abdulrahman Dambazau who presented the certificates of citizenship to the foreigners charged them to be good ambassadors of Nigeria. The last time a similar ceremony was conducted was in December, 2013. It’s the duty of the Ministry of Interior and the Nigeria Immigration Service (NIS) to process applications for Naturalisation from foreign nationals who have stayed/lived in Nigeria for a minimum of 15 years and those by Registration who are mainly married to Nigerians.